This summer my family and I took a trip to Fiji. To find an orphanage to support in Fiji, I went to Pack for a Purpose, and I found Treasure House Children’s Home, an orphanage located in Nadi. Treasure House currently serves 37 children ages 2-18 and are in dire need of supplies. To organize supplies for the children in Fiji, I talked to a local elementary school principal about organizing a supply drive. I created flyers and labeled bins and put the bins at various points within the school. At the end of the drive I was happy to see that we had almost 65 pounds of supplies! The hardest part was getting it to fit into our suitcases! With the help of Pack for a Purpose I was also able to contact the school and get permission to volunteer there. When arriving in Fiji we went to the orphanage. The reaction from the kids was unbelievable! 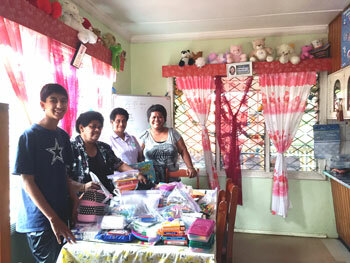 They were overjoyed to see that they had new notebooks, calculators, toothbrushes, and binders. I think that this was a great opportunity. I look forward to doing more projects in the future with schools in need around the world and Packing for a Purpose!